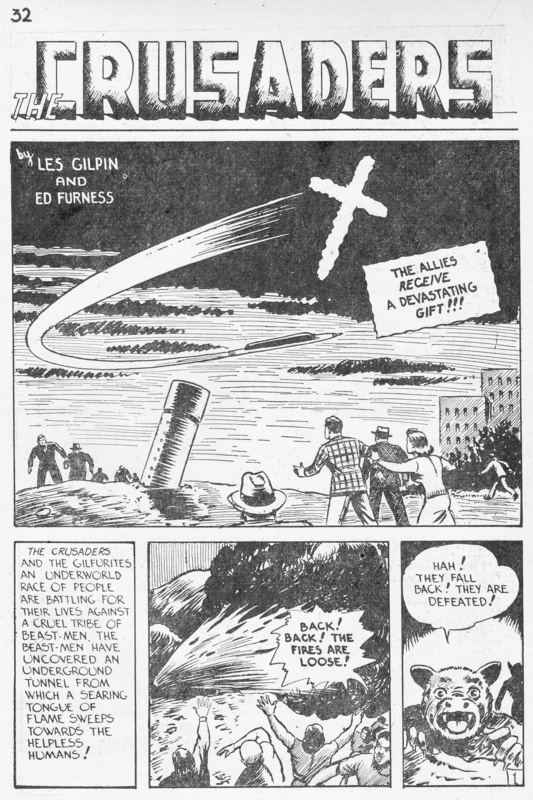 The “Crusaders” initially appeared in Grand Slam Comics and were created by Les Gilpin. In the beginning the serial was cartooned by him. 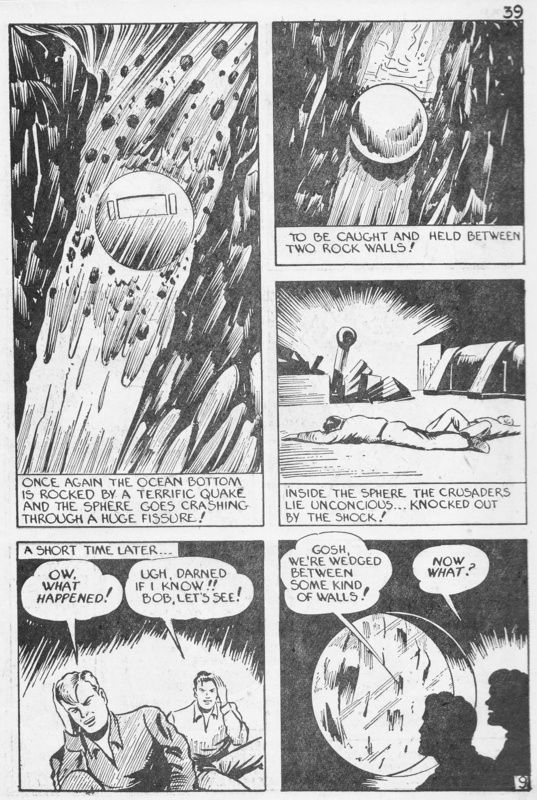 Then followed a period approximately from the beginning till the latter part of 1943 when it was co-cartooned by Gilpin and Ed Furness. 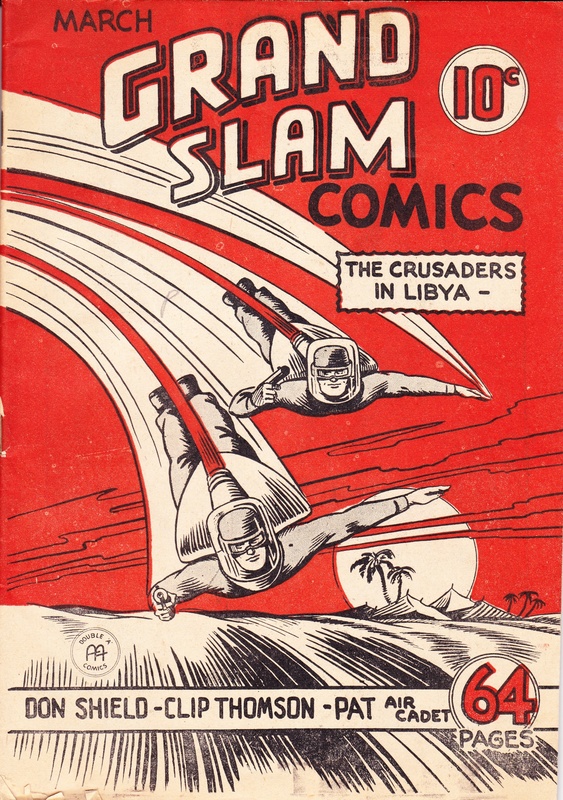 The “Crusaders” were transferred from Grand Slam Comics to Three Aces Comics. According to Ed Furness, Priscilla Hutchings did the finished art. The Crusaders were Bob Crawford and Paul Leighton, two inventors who fought the Nazis, but who operated outside any allied organization. Their sign was a cross in the sky to link them to the crusaders of old. Their adventures took them through the Middle East, France, Russia etc. The notable features of this serial were the advance equipment principally a rocket plane that looked very much like a space ship. 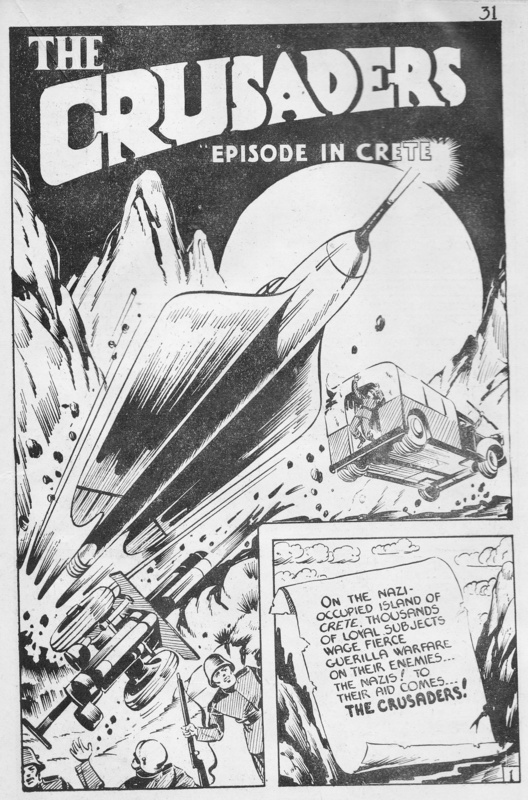 In Grand Slam issue 2-4 Mach 1943, the serial takes a detour from combating Nazis and the Crusaders invent a stainless steel sphere by which they descend to the Atlantic Ocean floor which in special pressure suits they explore. An undersea disturbance causes the sphere to plunge through a cavity in the ocean floor into a realm of people who are the descendents of the passengers of an English ship swallowed by a great whirlpool. After more adventures they return to the surface of the earth to fight Nazi in issue 2-7, June 1943. From this adventure and the type of equipment the Crusaders used, one can see a strong tendency toward science fiction. This drift is completed in an issue before Three Aces, 3-11, December 1944. A race, the “Jappani” of Sirius Beta under “King Krool” assembled a vast armada to come to earth to help the Japanese defeat the Allies. The “Crusaders” travelled through space to Sirius Beta to defeat this armada, and a whole new series of scifi adventures began. Meanwhile Louis, Paul Leighton’s sister who previously made casual appearances in the serial now became a regular. Front: Illus., Unidentified. Grand Slam Comics,… Anglo-American Publishing Co. Ltd.
1-5, April 1942. 1-6, May 1942. 1-8, July, 1942. Front: Illus., unidentified. Grand Slam/ Three Aces, V-50, January 1946. Anglo-American Publishing Co. Ltd.
“The Crusaders…” Car., Les Gilpin. Grand Slam Comics… Black & white interior. Anglo-American Publishing Co. Ltd.
“… In Libya.” 1-4, March 1942: 2-27. “…”1-5, April 1942: 3-22. “…” 1-6, May 1942: 3-22. “The Crusaders…” Co-car., Les Gilpin & Ed Furness. Grand Slam Comics… Black & white interior. Anglo-American Publishing Co. Ltd.
“…” 2-3, February 1943: 32-41. “…” 2-4, March 1943: 31-40. “…” 2-5, April 1943: 31-40. “…” 2-7, June 1943: 32-41. “… and the Dream Of Baron Todt!” 2-8, July 1943: 31-40. No story. 3-1, December 1943. No story. 3-2, January 1944. Reappeared in Three Aces Comics, 3-11, December 1944. “The Crusaders …” Contributors unidentified. Three Aces. Black & white interior. Anglo-American Publishing Co. Ltd.
“… The Armada of Doom.”, 3-11, December 1944: 3-16 sci/fi. “… and the Pygamy People.” 4-1, February 1945: 3-16. sci/fi. “… on the Planet of Old Age.” 4-2, March 1945: 11-19. sci/fi. “… The Robot World.” 4-2, March 1945: 29-38. sci/fi. 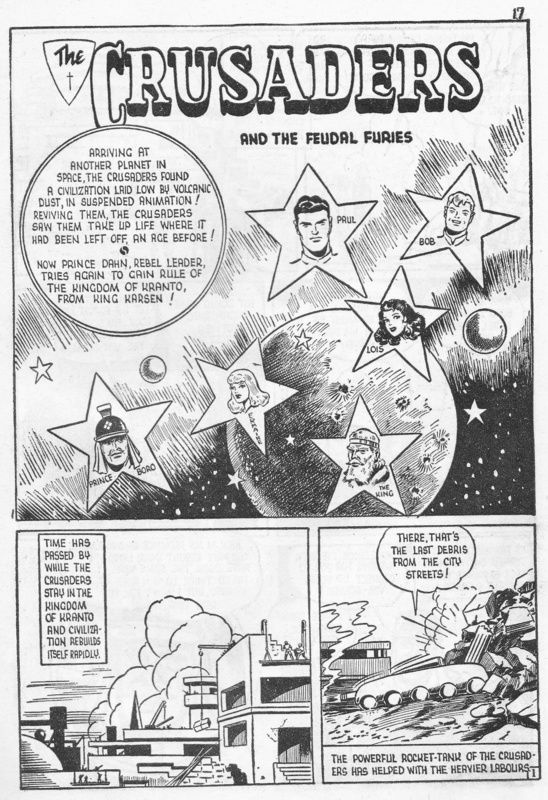 “… and the Feudal Furies.” 4-5, June 1945: sci/fi. Apparently no issue for July. “The Crusaders …” Contributors unidentified. Grand Slam/Three Aces Comics, Colour interior. Anglo-American Publishing Co. Ltd.
“ … And The Volcano Demons.” IV-48, November 1945: 23-32. sci/fi. “…” IV-49, December 1945:12-22. sci/fi. “… And The Hawkmen.” V-50 January 1946: 1-10. sci/fi. “The Crusaders…” Contributors unidentified. Three Aces. Colour interior. Anglo-American Publishing Co. Ltd.
No story. V-51, February. 1946. 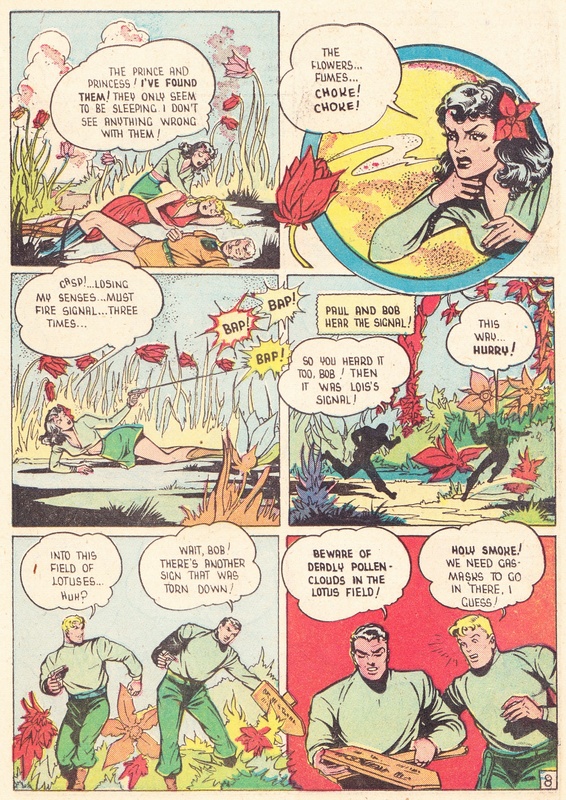 “… Land Of The Lotus Death.” V-52, May/June 1946: 16-28. sci/fi. “… The Holiday Of Terror.” V-53, July August 1946: 19-32. sci/fi. The Crusaders in their Rocket Suits. Grand Slam Comics, 1-4,March 1942: Front cover. Grand Slam Comics, 2-2, January 1943: 31. The Metal Sphere falls through the fissure. 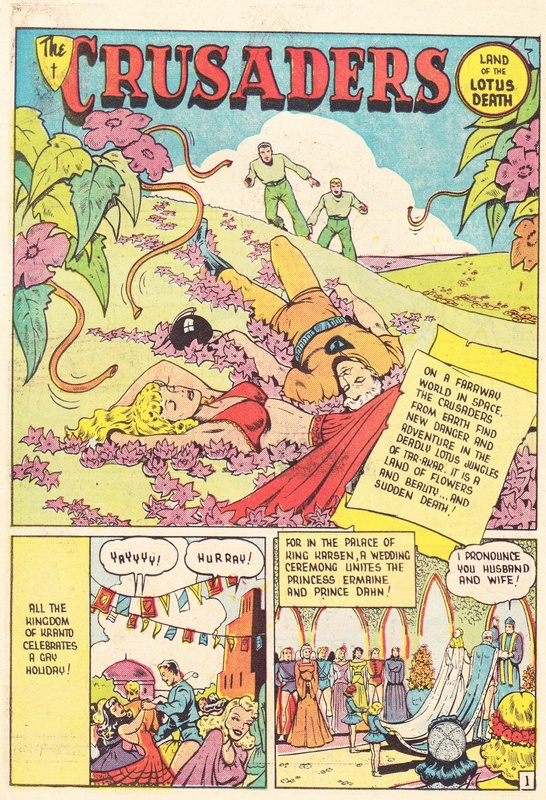 Grand Slam Comics, 2-4, March 1943: 39. Grand Slam/ Three Aces, V-50, January 1946: Front cover. These next two pages are likely Priscilla Hutchings work. 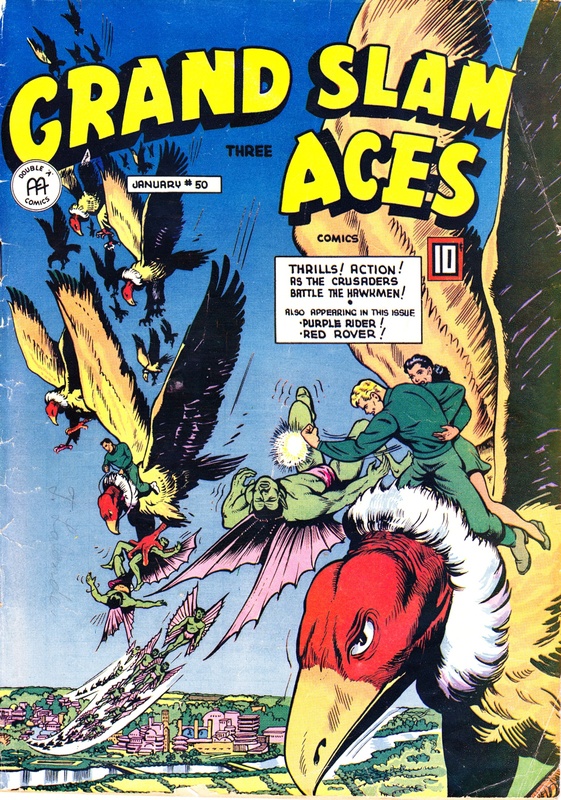 Three Aces Comics, V-52, June/July 1946: 16. Three Aces Comics, V-52, June/July 1946: 23.